It has been over two years now. 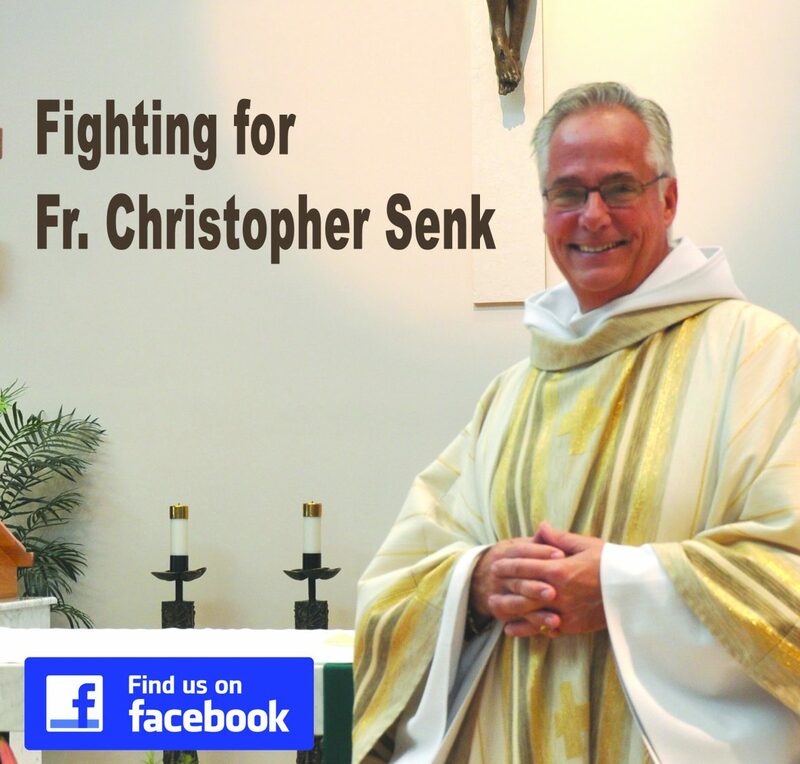 Late on Saturday afternoon, October 29, 2016 a representative of Bishop Frank Dewane of the Diocese of Venice in Florida arrived at Mass to announce to the people of St. Isabel Catholic Church that their pastor had been placed on administrative leave. The shocked community left Mass to be confronted by TV news teams, alerted by the diocese, seeking reaction. From that instant, the outrage, anger, sadness, and suffering of the community were destined to be part of a public event. All involved were forced to forego privately shared grief that could have led to resolution and healing. Immediately, the atmosphere of confrontation that so sadly infects our world was thrust upon a parish community that sought to worship God, to support each other, to provide outreach to the poor and marginalized, and to enjoy the life of their parish. It was a parish community that had been attacked when Hurricane Charley destroyed its church building in 2004. Yet that attack was on a physical facility, a facility that was rebuilt. This new attack was different; it was an attack on values, an attack on people, an attack on a way of life, an attack on faith. This attack was not a mere natural disaster; it was a manifestation of supernatural evil, an evil that infests and infects our world in many disguises. After this tumultuous period of months, where do we stand? Are we moving toward resolution? What will happen next? Are we destined for a permanent division or should all just resume business-as-usual? This is the Catholic Church, a hierarchical institution. It is an institution where the clergy dictate how things will be for the people, monitor and control who can serve or speak. The Church is an institution that tries to dictate where God has acted, an institution where black cassocks and red trim, or even the cappa magna, can be more important than compassion and seeking the salvation of all. On the other hand, the Catholic Church is an institution currently led by a pope who espouses mercy, justice, humility, the value of all human life, the need for harmony among all people; this is a Pope who wonders, “Who am I to judge?” Can these contrasting models and views of an institution coexist? What are the consequences when those in charge are more determined to be in charge than to find harmony? This is an era of rants and tweets, a time when evil thrives under the guise of killing suspected drug users without procedure, a time of unprecedented human trafficking, a time when political leaders in most of the world thrive on the spoils of corruption, a time when the innocent who only want security and opportunity for their families are forced to flee their homes under threat of death, torture, and starvation. We live in a time where the loudest voice is often defaulted to be the correct voice, a time when the mightiest gun is the right gun. And in the din, St. Isabel struggles, a microcosm of the surrounding world. There are two sides. One is a parish community led by its pastor that provides financial support to a pregnancy clinic, Catholic Social Services, the Bishop of Venice’s Annual Appeal for funds, and a host of charities. The members of the community enjoy each other socially; they share tragedies and joys; they eat together on holidays; they pray, sing, worship, and serve together at church. They welcome new people and mourn the deaths and departures of others. It is a sincere community seeking to strengthen faith and to live as Christ would have them do. On the other side is a bishop whose web site declares his mission is to be presiding in place of God over the flock whose shepherd he is, as a teacher of doctrine, priest of sacred worship, and officer of good order. In a nutshell, he has distilled his mission to being in charge. We presume good faith on the part of the bishop, but it is difficult to be in charge when many of one’s subjects are less than enamored with his leadership. It is hard to be a shepherd as bishop when one has never been a pastor, when one’s clerical experience rests largely in a Vatican office. It is easier to declare one is in charge than to act such that those being led will follow. The struggle to preside can be seen, for example, in the sixteen videos about the bishop on the diocesan web site. Fifteen of these are taken from 2011 through 2014. The only recent one is a slickly produced video congratulating the bishop on the ten years since his Episcopal Ordination as he has led the Diocese of Venice. There is little question the bishop is in charge, presiding as an officer of good order; it is harder to see the shepherding elements of his role. And thus we have an impasse: people seeking a compassionate shepherd in the face of a bishop who seems content merely to be in charge. The results of this impasse have been a scandal, one that tears at the fabric of a faith community. The bishop, at the insistence of her absentee family, claims that an elderly parishioner has been exploited by her pastor for financial gain. The community members in daily contact with the parishioner know no such exploitation occurred. The bishop, stung in the past by the fact that about 10% of his priests joined together to complain to a Vatican representative about his financial management and bullying tactics, insists on asserting his authority to make charges. Discussion of the pastor’s plight at meetings is forbidden and access to innocuous facilities such as the kitchen and church hall, commonly used for social gatherings and bereavement lunches, is denied. Any meetings require prior written approval and vetting of all remarks to be made. The people hold a prayer service in the church parking lot in defiance and then insist that they must be able to access the church they built following its destruction. The diocese relents. The people hold social events at the beach. The bishop, from a weakened position but in charge, adopts a buckshot approach, closes his eyes, and fires hoping that some element of a broadened spectrum of charges against the pastor that he conjures up will stick. Some people studying to join the Catholic faith leave; members of the parish seek spiritual assistance elsewhere; long time volunteers resign. The substitute priest declares that it is good that people leave if they are unhappy. The bishop stalls refusing to meet with parishioners. Cracks develop into fractures as factions within the community arise. Some people wear “Return Our Pastor” buttons while others claim that protest is “unChristian.” The bishop claims that to ensure lack of bias, he is sending the case he has constructed seeking full removal of the pastor to Rome for adjudication. People react with outrage and plead for justice. The anger simmers in a community trying to follow the call of Jesus. The contradictions are palpable. Where can people turn in the face of injustice by a hierarchical Church? Historically, insistence of the people in the Church on change has often been met by stiff resistance; but meaningful change in the Church is most often through movements of the people, inspired by the Holy Spirit who perhaps shares their frustration in moving the hearts of the bishops. How do the people now recover their sense of faith and community? How can the people support a puppet of the bishop planted in their midst to exert control? The parish is made up of people who are old and approaching death, of those who are younger but seeking spiritual growth to carry them through the challenges of aging, of parents who want a place where their children can be inspired to grow in the faith, of those who are disenchanted but belong out of habit, of those from the margins who are welcomed, of those who are sick or alone and need the support of others, of people who want to serve. How are these people to be embraced by a Catholic community so ravaged by dissent and division? What can this community offer to those who seek a place of refuge, a place where Christ’s love is evident? These questions challenge us, but we must strip away the posturing and the fears. Evil has been born in our midst. Do we accommodate its presence, allow it to tear something away from us just so that we might enjoy some calm? Or do we relentlessly seek justice? The overwhelming characteristic that the community as a whole has to offer is faith in Jesus. This is a faith that promises crosses to bear. This is a faith that never claims to be easy. This is a faith that promises the peace of Christ, a peace that surpasses all understanding. This is a faith that co-exists with, but must always fight, evil. The challenge for the community is to redouble its efforts to be faithful to Christ with a faith that requires love of God and love of neighbor; love of friend and love of enemy. This is a faith that declares hope, hope for the future despite an inability to imagine it, hope based on knowledge that God never abandons his people. The challenge for all parties is to seek God in all things, to be willing to make personal preferences secondary. People of faith endure in the face of hardship and persecution. That is the essence of faith. The call is to “find a way” to care for the sick, to untiringly seek justice for their pastor and in the world, to model unshakeable faith, illogical hope, and generous charity. This is necessary to defeat evil, to transform from evil into a more solid, a more committed, a more durable faith that knows how to deal with all the difficulties that living, and living as a Christian, provides. May God bless the parishioners and visitors to St. Isabel Church, restore its pastor, inspire its bishop, heal their shattered faith, reject the division that the world offers, and steel them to relentlessly reject evil in all its disguises.